A huge bust of Queen Nefertiti has been removed from the entrance to a city in Upper Egypt after locals compared it to Frankenstein. 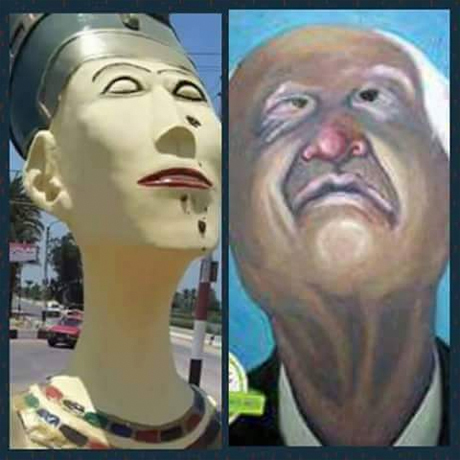 Officials in Samalout removed the bust after locals complained it was ugly and compared it unfavourably to the original world famous version. 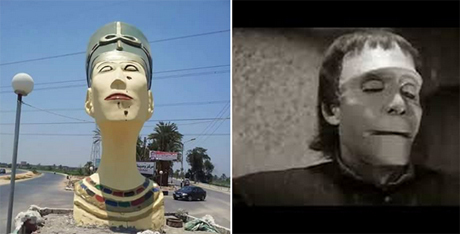 The bust was installed at the city's entrance on the Egypt-Aswan highway. The head of Samalout city, Gamal Kanaway, told Aswat Masriya that the bust would be replaced with a statue of a peace dove. 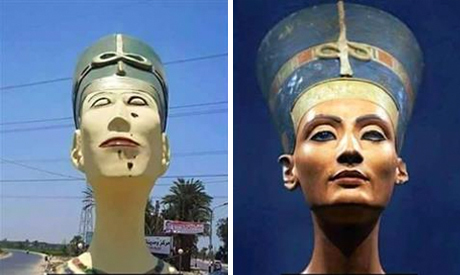 Photos of the bust went viral on social media on Sunday, with hundreds of Egyptians mocking the statue as extremely ugly compared to the original 3,300-year old Queen Nefertiti bust which was discovered in Ammarna, Minya governorate in 1912. One of the most widely shared photos compared the statue to Frankenstein in an old Egyptian film. Egypt has frequently asked Germany to return the original Nefertiti bust, which is housed in Berlin's Neuse Museum, but has been refused. Egypt king of thecountry in the world with great hetritage. this person not respect the great way of the pharaosh children. Live EGYPT Forever, Sisi the greatest! THe people and the army one hand! It's Frankenstein's Monster, Not Frankenstein. When will people learn? Frankenstein was the creator of the Monster. Who did this statue? It's terrible!